MOHUA Recruitment 2019 - Job notification for Assistant Library and Information Officer Post in MOHUA, New Delhi on Deputation Basis. Applications are invited by the Ministry of Housing and Urban Affairs within 45 days from the date of publication Application in the Employment News for 1 vacancy. Max- 56 years as on the closing date of receipt of applications. i) Bachelors Degree in Library Science or Library and Information Science of a recognised University or Institute. ii) Two years' professional experience in a Library under the Central Government or State Government or autonomous body or statutory organisation or public sector undertakings or University or recognised research or educational institution. Eligible candidates may send their application in prescribed format (attached below) through proper channel to Under Secretary (Admn. ), Mio Housing and Urban Affairs, Room No. 209, C-Wing, Nirman Bhawan, New Delhi within 45 days from the date of publication Application in the Employment News, along with photocopies of APARs/ ACRs for the last five years duly attested by an officer not below the rank of Under Secretary or equivalent. MOHUA Recruitment 2019 - Job notification for OSD (Urban Transport) Post in MOHUA, New Delhi on Deputation Basis. 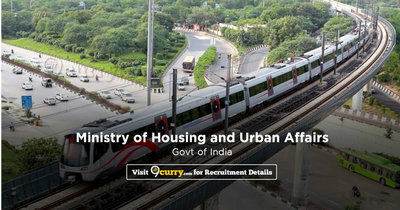 Applications are invited by Ministry of Housing and Urban Affairs within 30 days from the date of publishing of Vacancy Notice in the Employment News for 1 vacancy.